Along with cherry blossoms, the arrival of Spargelzeit, and the opening of biergartens, Germany's Spring Festivals are a sure sign that warmer weather is on its way. The king of the season is Stuttgart's Spring Festival, better known as Stuttgarter Frühlingsfest. This event is the junior to a mega fall festival in Stuttgart known as Cannstatter Wasen in the local dialect. The spring event has many of the same attractions, leading it to be known as the little brother of the main event. It began in 1818 by King Wilhelm I and has been running in modern times for ever 80 years. 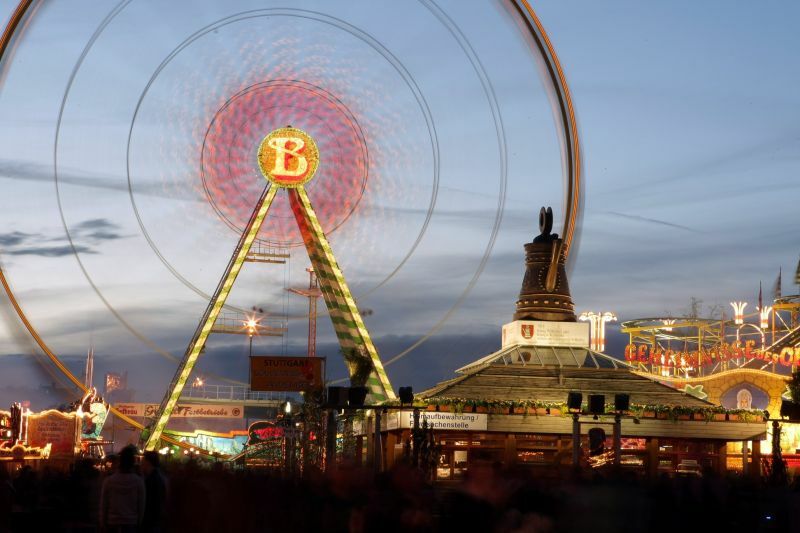 Stuttgarter Frühlingsfest is the largest spring festival in Europe, attracting around 1.5 million visitors each year. Follow this guide to Stuttgart Spring Festival to enjoy the best of the Fest. The Frühlingsfest has stalls and stalls of delicious food and sweets, live Schlager music and performances and - of course - beer. Just like Oktoberfest, there are beer tents and endless naßkrüge (1-liter mugs). The beer tents are the place to be for the spring festival. Admission is free, but during high times the tents may reach capacity. Visitors can easily find a spot before 16:00 - just cozy up on the benches to the other drinker. To ensure you have a spot in the evening, make a reservation at your favorite tent. Almhüttendorf - Featuring an alpine atmosphere (complete with edelweiß sign), this tent has Tyrolean specialties in ski lodge decor. Grandls Hofbräu Zelt - One of the most popular and raucous tents. Göckelesmaier - Provides a typical Volksfest (folk festival) experience. Wasenwirt - Sponsored by SWR3 radio station, this is where the party is at. The fairgrounds are not just a place to drink, there are great rides to go with your alcohol consumption. A time-honored - if a bit nauseating - German festival tradition, the biggest attraction is the massive 47-meter Ferris wheel. Riders can observe the grounds from above, as well as the other rides and sights of the city. Krämermarkt began with the fold festival in the medieval ages. It is a traders' market of everything imaginable from clothing to herbs to leather goods to jewellery to gifts. Look for the rows of booths near König Karls Bridge and shop away. When is the Stuttgart Spring Festival? This 78th annual fair usually occurs mid-April to the beginning of May and will be kicking this season into high gear on April 16th, 2016. On the opening Saturday there is the traditional tapping of the keg by the mayor of Stuttgart. Once the beer starts flowing, it doesn't stop til May 8th. When planning your visit, keep in mind special events like the opening day with the ceremonial tapping of kegs as well as family days. On every Wednesday there are family days with special offers for parents (like discounted parking) and children (half-price rides). Look for face painters, a fairy tale carousel, and kid-friendly rides like the children’s railway. There are even kid's menus at many of the food stalls. Where is the Stuttgart Spring Festival? The festival takes place on the famed grounds of Cannstatter Wasen, the traditional fairgrounds on the banks of the Neckar river in the city's Bad Cannstatt district.